Monday morning was beautiful weather for a field trip and Central Academy social studies students took a special one, courtesy of C-SPAN and its local benefactor, Mediacom. The C-SPAN bus is on a tour of all 50 of America’s state capitals and Des Moines is stop #40. Mediacom Communications Director Phyllis Peters arranged for 120 9-12 graders to tour the rolling civics laboratory in collaboration with Central Academy teacher Canada Snyder. Students boarded one of the usual yellow buses that shuttle them on their daily rounds in the district and rendezvoused with the souped-up C-SPAN model parked at the western edge of the statehouse grounds in the Iowa Capitol complex. 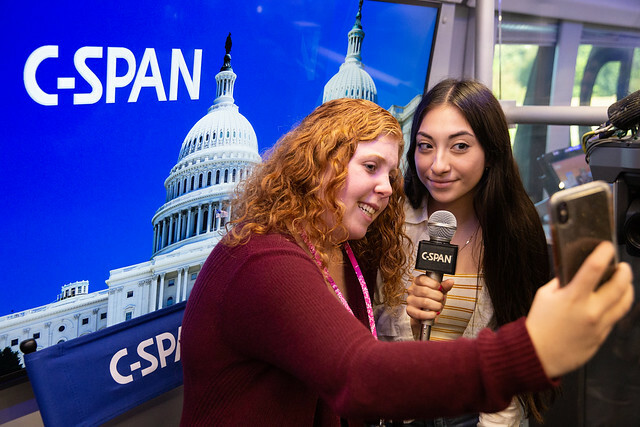 There, in shifts, they took a whirlwind tour of an interactive mobile classroom, a crash course in all things C-SPAN, the unsung public service network. One of the things they learned during a brief lecture onboard is that six cents out of every monthly cable subscription payment to Mediacom redirects to C-SPAN, the network created by the cable TV industry in 1979 to provide independent, nonpartisan coverage of the nuts and bolts of Congress. It’s a livestream of democracy in action, or inaction, as the case may be. Six cents a month to keep our eyes on our government has got to be the best bargain on TV, so thanks, Mediacom, the same cable provider that makes DMPS-TV possible. The opportunity was a brief departure from whatever Jason Danielson’s World History: Peoples & Places class is otherwise studying, but not too far off course. The slogan Where History Unfolds Daily is emblazoned on the bus. And besides, “It’s better than a quiz on Chapter Two,” Danielson reminded his students. Free civic swag was available in the form of copies of the US Constitution, presidential rulers decorated with portraits of all 45 US presidents and C-SPAN ballpoints, among other things. The DMPS group was also the first to learn details of the 2019 StudentCam contest, C-SPAN’S 15th annual documentary film competition, which will be officially announced on Wednesday. This year’s theme is What Does it Mean to be an American? Prizes valued at more than $100,000 are offered, including $5,000 cash to the winner(s). “I liked all of the interactive, technology stuff,” said Enya Cid, a 10th grader at Lincoln, before reboarding her same old, same old school bus for the ride back to Central. Others had their curiosities piqued by the video contest. So might many others who didn’t catch the C-SPAN bus. For more information, click here.